The personal daily choices and actions of consumers have a significant impact on the overall greenhouse gas emissions and the consumption of natural resources. 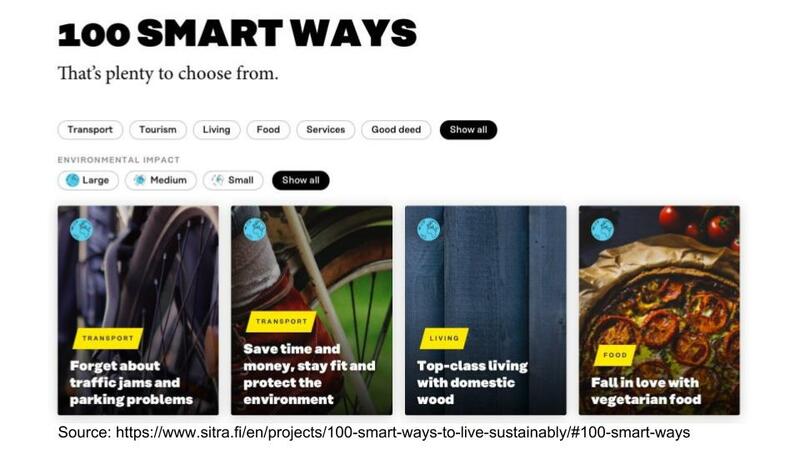 In 2017, to map sustainable means for leading a good life and the opportunities for expanding the market of such consumer choices, Demos Helsinki, Sitra and D-mat implemented a project to report on 100 smart consumer acts. Accordingly, 100 such existing consumer acts were identified that are expected to create an incentive for consumers to behave more reasonably – with respect to the environment and the nature’s carrying capacity. The acts have been mapped from different sectors of the consumers’ daily lives. The consumer acts were assessed through the use of 15 criteria included in a framework card compiled by Demos’ team. The incentives as well as possible obstacles and bottlenecks were assessed in relation to the possibility for each of these acts to become more common in society. Furthermore, interesting opportunities were identified when analyzing the motivators, enablers and the market situation of these acts. In addition to more sustainable behavior, consumers have, with various of the identified acts, the possibility to achieve significant economic benefits while simultaneously promoting more communal, fun and diverse daily life. Also, the opportunity for the private sector to take up the challenge was recognized. This refers to the private actors’ possibilities for creating new services and products for consumers, along with developing the already-existing services towards a more sustainable direction. The role of employers and the culture of the workplace was additionally identified as significant in enabling the performance of many of the identified sustainable daily acts. Public sector actors, on the other hand, can contribute to speeding up the change by updating the taxation and other guiding mechanisms. As a continuation for the project, Demos Helsinki carried out a supplemental exploration into the resource-wise lifestyles in a world constructed according to the 2050 future scenario. As a result, Demos Helsinki compiled 50 future sentences that describe the resource-wise world in 2050. More information about the project can be found on the project’s website.